Stacey in Blacksburg Virginia where her team won its first Safety Award of the season. “When I was little, my sister and I would get Happy Meal toys at McDonald’s. I would go home and use a tiny screw driver to take the toy apart. I always wanted to know how it worked,” said Stacey Mescher, sophomore at Deep Run High School. Today, Stacey is doing a whole lot more than disassembling plastic toys. 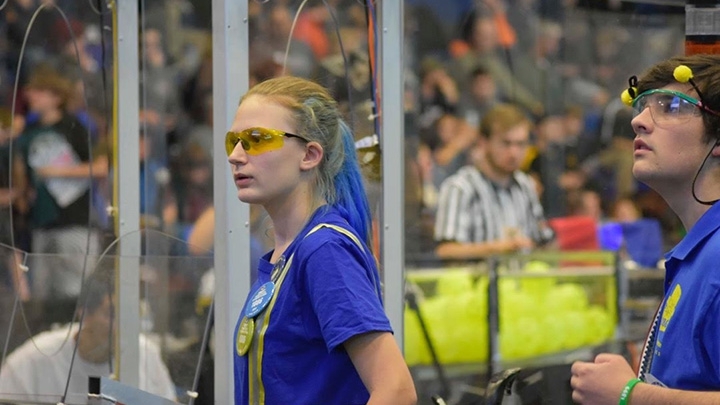 She is a key member of the FIRST Robotics Competition team Blue Cheese at her school, and she is working towards a goal of making the future a better place for everyone. FIRST Robotics founder Dean Kamen said, “If you’re not working on important things, you are wasting time.” Stacey seems to be making the most of her time. She credits FIRST robotics with providing a platform to explore different types of engineering, but for now she thinks she wants to become a mechanical engineer, “I want to help build things that will make the world a better place”. This year, she is also collaborating with her Henrico Center for Innovative Technology class to use Bluetooth technology to develop a product that will monitor water flow. “It started with someone wanting to make their shower change color. We decided that we wanted the invention to also do something that will help conserve water and improve the world that we live in.” With young people like Stacey in our community, our future is looking brighter and brighter. Stacey’s team will be hosting a FIRST Robotics Competition event at Deep Run High School, March 25th and 26th. Also, come out and see the best and brightest high school robotics teams from Virginia, DC, and Maryland compete at the FIRST Chesapeake District Championship Sponsored by Booz Allen Hamilton at VCU’s Siegel Center, April 7th and 8th. Both events are free, open to the public and family friendly.